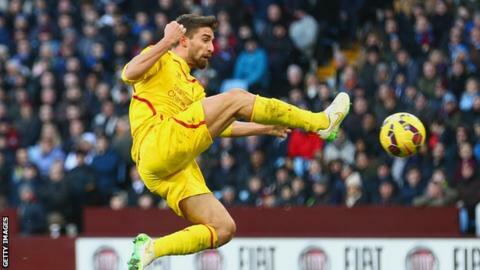 Sunderland have signed Liverpool forward Fabio Borini for a fee that could rise to £10m. Italy international Borini had a loan spell with the Black Cats during the 2013-14 season, scoring seven goals in 32 matches, but then rejected a permanent move to the Stadium of Light. The 24-year-old was also a target for Inter Milan, Fiorentina and Watford, but their bids were turned down. Liverpool may also sell defender Jose Enrique, a target for West Brom. Watford, newly promoted to the Premier League, had offered £7m for Borini, while Inter's bid was worth £6m. Fellow Serie A side Fiorentina were also keen on the striker but Borini decided to join Sunderland. The Black Cats, who have allowed Italy winger Emanuele Giaccherini to join Serie A side Bologna on a season-long loan. will pay £8m up front, but the deal could eventually be worth £10m to Liverpool with add-ons. Borini was the first signing of Reds boss Brendan Rodgers in July 2012, when Liverpool paid Roma £11m. Rodgers had worked with Borini at previous clubs Chelsea and Swansea. He has scored three goals in 38 appearances for Liverpool. Meanwhile, Spanish left-back Enrique, 29, is surplus to requirements after four years at Anfield. West Brom boss Tony Pulis is keen to strengthen his squad and the Baggies have made their interest known. Rodgers is willing to let Enrique go as it is unlikely he will figure prominently, if at all, this season. Enrique, signed by Kenny Dalglish from Newcastle United in a £6m deal in August 2011, has also interested David Moyes's Real Sociedad.